STANELCO ACME 3, 2 KW. STANELCO ACME 1, 1.5 KW. RADYNE 35 CW, 3.5 KW. STANELCO DUBLE HEADED F/W 4.0 KW. 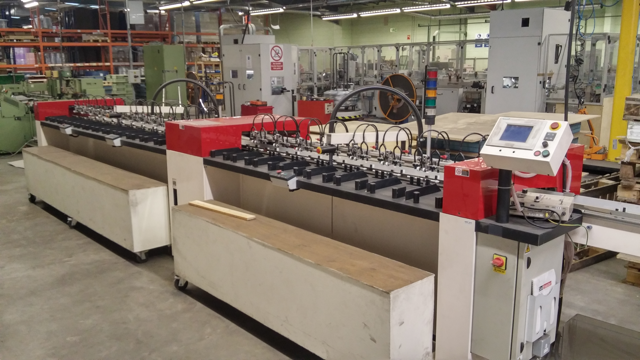 THOR 1523, WITH PLC, HEATED PLATEN, 15 KW, 700MM X 1000 MM. THOR 1523, WITH COMPUTER, HEATED PLATEN, 15 KW, 700 MM X 1000 MM. RADYNE BW6, 60 CW, UP AND OVER, 800 MM X 600 MM, 6 KW. RADYNE BW6, 60 CW, UP AND OVER, 800 MM X 600 MM, 10 KW. HFD UP AND OVER, 10 KW, 850 MM X 650 MM. HFD UP AND OVER, 7 KW, 700 MM X 500 MM. THOR 1022, UP AND OVER, 10 KW, 700 MM X 500 MM, COMPUTER. RELCO TR7, 730 MM X 520 MM, 7 KW. STANELCO TP 80, 720 MM X 520 MM PLATEN. 8 KW, BLUE. RELCO SIDE SHUTLE, 5 KW. RELCO SINGLE SHUTTLE, 3.5 KW. THOR 1525, 4 STATION, HEATER, 800 MM X 650 MM, COMPUTER. THOR 1525, 4 STATION, HEATER, 800 MM X 650 MM, PLC. THOR 1525, 4 STATION, HEATER, 800 MM X 650 MM, COMPUTR. THOR 1525, 6 STATION, HEATER, 800 MM X 650 MM. HFD 6 STATION, 730 MM X 520 MM, HEATER, 10 KW. TRANSITMAKE 9 KW, 4 STATION ROTARY, 700 MM X 500 MM. TRANSITMAKE 9 KW ROTARY, 4 STATIONS, 700 MM X 500 MM. TRANSITMAKE, 15 KW, 800 MMX 600 MM, HEATER, HOT FOIL BLOCKING, ROLL STAND INDEXING. THOR 1221, 12 KW PNEUMATIC C-PRESS. FIAB 12 KW STATIC C-PRESS. FIAB 8 KW STATIC C-PRESS. SVENSKA 5 KW STATIC C-PRESS. ECOWELD 1200, NEW, 1200 MM LONG WELD. HANG 105 TWIN HEAED RIVITER. SECKINGER 220, TWIN HEADED RIVITER. SEBA 200 TWIN HEADED RIVITER. ARNO 105 TWIN HEADED RIVITER.